We were lucky to attend a screening at New People Cinema in Japantown, San Francisco. I admit that I am a movie screening junkie. I love the way that festivals and screenings give you access to the talent and background to each movie. Now, back to the movie. Tatara Samurai centers around Gosuke(Go-Su-Kay),a young, kind-hearted boy, living in the Sengoku (Sen-Go-Koo) Period. Born in the village that specialized in forging steel in a traditional practice known as Tatara, Gosuke is predestined to become the grand master of steel, known as Murage. When his village’s master of swordsmanship is slain, Gosuke decides he must be the one to protect his village, and leaves his home behind to become a samurai. He meets a visiting merchant who introduces him to a connection to join the honored Oda Army to satisfy his desire to be a samurai. Gosuke is so afraid in his first battle that he runs from the battlefield. He feels the shame and guilt that comes with failing to attain his desire to become samurai to protect his people, but when he returns to his village, he is greeted warmly and accepted once again. However, a merchant who had helped him in the past, influences Gosuke to protect the village by making village steel into guns. The merchant has a ulterior motive to take over the village and the steel. The movie ends with a clash between a local lord and the village. See my notes below. 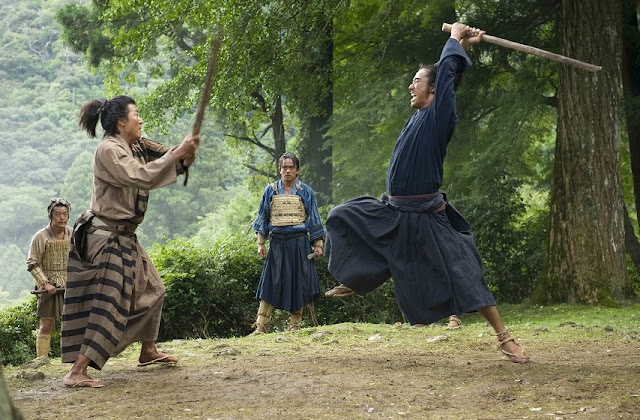 Eugene Nomura - "Samurai spirit is in many people who are not samurai"
Eugene Nomura -"The film is about peaceful ways to avoid conflict"
Eugene Normura - "Hardly no VFX"
Naoki Kobayashi - "The hardest scene was the fighting at night." Naoki Kobayashi - "This is my 1st movie"
Naoki Kobayashi - "I am inspired by Toshiro Mifune, Yasuku Matsuda, and Leonardo DiCaprio"
If you like Japanese movies, this one is a "must see". The big screen brings out the rural beauty of Japan's rural areas. Please check it out.